When your faith is challenged, these 12 men have the answers! 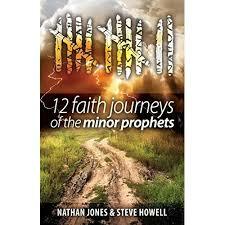 Gain a richer, deeper and lasting faith along with the Minor Prophets on their own personal faith journeys. Join Hosea, Joel, Amos, Obadiah, Nahum, Habakkuk, Zephaniah, Haggai, Zechariah and Malachi as hey explore the realities of a faith that can withstand loss, injustice, confusion, guilt and so much more. These twelve messengers of God learned trust and obedience in the midst of great challenges. As a result, they discovered confidence, reliance, credibility, belief, and trust—discoveries that are still exciting and applicable to us today! Their lessons and their faith in God can be yours. Are you ready for a faith journey with the Minor Prophets?